I wonder why, when even has a well-known literary compression e'en, there is no equivalent he'en for heaven or gi'en. Heady stuff! The links have it. As for Mariah Carey, considering what else she does to the whole carol, it's just as well your attribution of her disyllabic heaven to American compression preferences is speculative! Harry, I can only think of "I hae gi'en my voice to Jesus", but I feel sure there are less problematic examples. @Mr Campbell: even usually isn't stressed in a phrase. (The adjective even = 'plane' &c. doesn't have the alternative e'en.) Given isn't stressed as often as heaven, and indeed the OED shows older forms without the v.
mallamb, you sure it's not "I hae gi'en my lower lip to Jesus"? Any bit except the faculty of Pure Reason is ill-gi'en. Is there anyone who consistently distinguishes /ˈsev.n/ "seven" from /ˈsev.ən/ "Severn"? Or is the transcription of the former as /ˈsevn/ in most dictionaries another example of a distinction without a distinction? Yes I do, and /ˈbɪtn/ 'bitten' from /ˈbɪtən/ 'bittern', /ˈpætn/ 'patten', 'paten' from /ˈpætən/ 'pattern'. You may find this hard to believe, but I am always banging on about the upper limit of distinctive realization, and this is what makes this distinction justifiable. But only for a probably quite restricted population of consistent speakers. I guess you are supposing most non-rhotic speakers have ˈsevn for both, and I think so too, and products of elocution lessons and other distinctly eccentric speakers may be observed to have ˈsevən for both. You may infer that I don't like ˈsevən for seven, and am convinced I would never say it for seven, except in circumstances which I think belong not here but in pragmatics, for example in order to put ridiculous emphasis on the word in exasperation. And that in much reduced circs I would be capable of saying ˈsevn for Severn while intending to say ˈsevən and perhaps even thinking I was doing so! So in my idiolect ˈsevən is distinctive with respect to ˈsevn but not v.v. But I would not be capable of saying ˈbɪtn for 'bittern', I guess for lexical reasons. It is not uncommon for distinctions to be as strapped for distinction as this. However this is not a sufficiently functioning distinction to hold for the unindividuated totality of non-rhotic speakers on the hoof. Dictionaries are uncritical of 'distinctions without a distinction' in the overall system. French dictionaries distinguish between a and ɑ, and so still do many speakers, but that distinction can be anything from non-existent to reversed. The distinction between Fr ɛ and e is not in much better shape. Neither are the shifting sands of ɔ ɒ ɑ ɒʊ oʊ etc. that we have been talking about in previous threads. mallamb: are you near-RP from the west country? 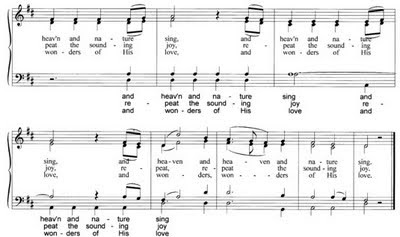 Singing in an American choir, I was taught to sing the last line as "[he-evn], and [he-e-evn], and nature sing", thus stretching the monosyllabic pronunciation over two or even three notes rather than switching to the more natural disyllabic. In practice the [n] becomes the onset of the following syllable. In ordinary speech I would never reduce heaven. This introduces a related topic of how syllabic consonants are interpreted by singers when they are set to notes of their own. Examples are "little", "people", "counsel" and "nations", where the second syllables in these words are set to notes whose value lasts for up to several seconds. (In keeping with that Christmas theme, I am citing examples here from Handel's "Messiah".) Using the syllabic consonant to sustain through the pitch is certainly not the answer. ie. [piplllllllllll]. Rather, a vowel has to be chosen and "inserted." Schwa would be the natural choice, but I hear many singers routinely modify that /ə/ to /ɪ/ or /ʊ/ or /ʌ/, perhaps because schwa sounds odd when lengthened to that extent. It would be interesting to do a study of English singers (and I don't mean pop singers who do not normally hold themselves to a standardized "lyric diction") to see which neutral vowel is chosen in which consonant environments. Perhaps there is a preferred system of "un-syllabifying" syllabic consonants. @Harry Campbell. Indeed, and "ever" has "e'er" and "over" has "o'er". @army1987 Well, that's a new one on me, a difference between a pronunciation of "seven" and a _non-rhotic_ pronunciation of "Severn". I grew up in Malvern among non-rhotic speakers, and Severn was always pronounced identically to seven: /ˈsɛvən/. When the name The Severn Singers was suggested, for the name of a newly-formed choir, one objection raised was that the name suggested that it had 7 singers, an objection that depends on the supposition that listeners would not hear any distinction between "seven" and "Severn". @nedecky That study could usefully study what vowel singers choose when singing _any_ syllable whose vowel is usually schwa in connected speech, not just those whose coda consonants are deemed to be syllabic. ("The", "a" and "to", for example.) The fact that singers sometimes sing a vowel other than schwa doesn't imply that there is no schwa in connected speech. – In ordinary speech I would never reduce heaven. But because as far as I know there is no synchronic possibility of anyone interpreting my claim to say [ˈsɛvn] etc. that way, I regret to say I didn’t use the syllabic marker. Equally regrettably, neither does the OED: /ˈhɛvn/, U.S. /ˈhɛv(ə)n/. So to interpret your statement that in ordinary speech you would never reduce heaven, I need to know which of the two US options given there you would use. I find a lot of US speakers make the vowel of the second syllable very obvious, not least because it's not a schwa at all: [ˈhɛvɪn] never ceases to amuse me! – mallamb: are you near-RP from the west country? No, plain old-fashioned RP from the Home Counties. – I grew up in Malvern among non-rhotic speakers, and Severn was always pronounced identically to seven: /ˈsɛvən/. Well if you put that in solidi it implies there is a potential distinction, presumably between that and /ˈsevn/. I am the one claiming that the ə can have phonemic status there (actually in my own ananlysis quasi-phonemic). But if it was pronounced identically to seven that would normally be [ˈsɛvn̩] surely (I've started marking syllabicity, as it looks from the above as tho my failure to do so before caused some misunderstanding. If you grew up among choristers you will no doubt have heard [ˈsɛvən] as well, but for both! Did they also grow up in [mɔːlvən] or did they think they were in [mɔːlvn̩]? Much less likely, because even dinosaurs like me don't distinguish between sylvan and silvern, and I can't imagine there not being some sort of schwa in there. – When the name The Severn Singers was suggested, for the name of a newly-formed choir, one objection raised was that the name suggested that it had 7 singers, an objection that depends on the supposition that listeners would not hear any distinction between "seven" and "Severn". My previous post is entirely consistent with that. And those listeners would include me, for the reasons I gave there. Yes, a study of which vowels singers choose in any extended schwa would be interesting. "The fact that singers sometimes sing a vowel other than schwa doesn't imply that there is no schwa in connected speech." I agree, but for "the" "a" and "to" there are suggested guidelines provided in standardized diction manuals/pronunciation dictionaries. I grew up on the prairies in Canada — a wholly rhotic environment. One of my favourite shows as a kid was Doctor Who. I went for years incorrectly believing that that menacing alien race were the "Darleks." Is the l in Malvern pronounced locally? But I was talking about the likelihood of ˈsɛvən being an over-careful pronunciation of 'seven', of the kind that would go with [mɔːlvən], and trying to show that that cluster would be a counterexample for my claim to have an opposition between –n and ən in seven~Severn. The distinction between Fr ɛ and e is not in much better shape. See, this is a case that shows why IPA signs shouldn't be used without some sort of brackets. The distinction between [ɛ] and [e] is in perfect shape and shows no sign of either going away or becoming end points of a continuum or something – but there are people for whom these sounds are allophones of a single phoneme, [ɛ] occurring only in closed syllables and [e] only in open ones. [ɔ] and [o] appear to be headed in the same direction. Using the syllabic consonant to sustain through the pitch is certainly not the answer. Why actually? It comes naturally to me, even though the alternative [ɛ] is available in German. I find a lot of US speakers make the vowel of the second syllable very obvious, not least because it's not a schwa at all: [ˈhɛvɪn] never ceases to amuse me! Indeed. I was rather shocked by the [ˈt͡ʃɪkɪnˈt͡ʃɪkɪn] video. I wouldn't have guessed that anyone would seriously say anything other than [ˈt͡ʃɪkŋ̩] except maybe when singing, yet this guy manages to keep using two more or less identical vowels in this word for four minutes, and then the plant in the audience does likewise! Madness! IPA signs CAN be used without some sort of brackets if the meaning is obvious. Was the obvious meaning that the phonetic distinction is not in good shape? No. Do you imagine I don't KNOW that "there are people for whom these sounds are allophones of a single phoneme, [ɛ] occurring only in closed syllables and [e] only in open ones"? That is integral to what I'm saying! And those people are in all zones of space-time. [e] has only ever been supposed to occur in open ones, at least since the IPA has been in existence, I should imagine. But in prominent, final open syllables the phonemic distinction between /e/ and /ɛ/ was supposed to be in good shape, and it ain't. I hope there will also be people who understand why I don't trust myself even to attempt to discuss what you say about [ɔ] and [o]. – I find a lot of US speakers make the vowel of the second syllable very obvious, not least because it's not a schwa at all: [ˈhɛvɪn] never ceases to amuse me! – Indeed. I was rather shocked by the [ˈt͡ʃɪkɪnˈt͡ʃɪkɪn] video. I wouldn't have guessed that anyone would seriously say anything other than [ˈt͡ʃɪkŋ̩] except maybe when singing, yet this guy manages to keep using two more or less identical vowels in this word for four minutes, and then the plant in the audience does likewise! Madness! But you give me straws of communicative competence to grasp at. But madness this schwi is not. Who are we to say it is? It's their language! @mallamb. You said "if you put that in solidi it implies there is a potential distinction, presumably between that and /ˈsevn/." I don't see that I was implying any such thing. The reason I used solidi was merely that I was talking about what people think of words' pronunciations as being, namely phoneme-sequences. For you, "seven" is "[ˈsɛvn̩] surely", i.e. surely there cannot be a schwa, and the [n] must be syllabic, but in "sylvan" "you can't imagine there not being some sort of schwa in there." How do you decide whether to transcribe an [n] (or for that matter an [l] or an [m]) as syllabic or as preceded by a schwa? Can you or can anyone come up with a minimal pair for /n̩/ and /ən/ which works in rhotic accents (so seven-Severn and bitten-bittern won't do)? Or for any other syllabic C v. schwa+C? I see no reason to suppose that there is a phonemic difference here, and so prefer to transcribe English phonemically with schwa+consonant, not with syllabic consonants. Accordingly, I use /ˈsɛvən/ for both "seven" and "Severn", as pronounced by me and the non-rhotic people I hear. "Malvern", btw, has always been /ˈmɒlvə(r)n/, thus /ˈmɒlvən/ for me. The l is pronounced. The first vowel is a CLOTH vowel, and even in my childhood in the 60s and 70s [ɔ] would've been old-fashioned and posh. My father (who studied electronics) made puns about "The Vaults" (a pub in Malvern) and "volts", both /vɒlts/ for us, as we have the LOT/CLOTH merger. I guess there must be surprise and amusement on both sides of the pond at our different ways to reduce unstressed vowels. to the end of the YouTube ID. I'm simply staggered that anyone would regard [tSIkIn] as an unusual pronunciation of the word chicken - it's the one I've always found to be the most common, with [tSIk@n] a rarer alternative. As for [tSIkN], that looks like some horror from a Causasian language (coda [kN]?). Lipman: it is a general feature of some English accents - especially in the North of England, and especially not in the Southeast (incl. in RP) - that THOUGHT cannot occur before preconconantal /l/ (unless it's morpheme-final), being instead realised as LOT. So, in these accents, 'call' and 'called' have THOUGHT, whereas 'Calder' has LOT (they are all THOUGHT in RP). This feature seems to be becoming more common due to the diminishing influence of RP. (it's also starting to appear in l-vocalising accents in SE England, seemingly as a way of maintaining more minimal pairs for those speakers who have merged non-word-final /O:/ (except before /r\/ ) with word-final non-prevocalic /O:l/, /Ul/, /u:l/, and /@l/, but this is perhaps not relevant). @Jay Thank you for that YouTube info. @Lipman No, LOT/CLOTH merger and CLOTH/THOUGHT split. I picked CLOTH rather than LOT based on whether it seemed to me that someone with the LOT/CLOTH split could pronounce the word with my THOUGHT or my LOT vowel. I'm thinking here of an old-fashioned posh English accent, the sort that we poke fun at by using "gorn orf" or "gawn awf" for "gone off". From Fowler's Modern English Usage, 2nd ed., "Pronunciation": "Al followed by a consonant is pronounced in six different ways: ... awl (or ŏl) as in altar ... . With T it is awl (or ŏl) (salt, falter) with some ăl exceptions [which don't include any words we've mentioned so far] With V it is ... awl in Malvern." Let's call these the SALT words. I go with Fowler in making Malvern a SALT word. I see that SALT words are put in THOUGHT. That's not my experience of southern English accents nowadays. I pronounce SALT, LOT and CLOTH words, and generally hear them, with [ɒ], but THOUGHT with [ɔ]. Bebedora, thanks, exactly, that's what I meant. Richard Sabey, I'm afraid I don't quite understand why you used these categories, but I get what you meant. The 1930s BBC guide has Malvern both with and without the /l/ (but only with the THOUGHT vowel). Usually they're quite into spelling pronunciation, even explicitly, so maybe the l-free pronunciation is an older one that doesn't exist anymore today in the local language. For I too am staggered that anyone would regard [tSIkIn] as an unusual pronunciation of the word chicken – but it's not the one I've always found to be the most common, and [tSIk@n] is if anything winning the battle in BrE as well, with the dread T Blair inflicting the whole gamut of those pronunciations on us. If you saw our discussion of -Iz on 'spouses' you will be able to deduce that I have the same horror of [tSIkN] as you, and even of [tSIk@n], actually. But I guess it's pretty well established worldwide. A racist Irishman even attacked me for [tSIkIn] etc., saying "I hate the way you English say [tSIkIn] for [tSIk@n]. I find that deeply OHfensive." Which I thought was barmy even for a bigot, so I said, "Well I find OHfensive offensive!" Lots of interesting stuff here this morning, but no more time now. Getting back to heaven (if I only could! ), while it's true that many, probably most, Americans don't do as much compression as much as most British do, I was taught to sing "heav' nand nature sing," just as John Cowan and nedecky were. This type of liaison is - dare I say it? - standard in choral singing of a type that many pop singers simply haven't learned. My chorus teachers were influenced by Robert Shaw, although they didn't put us through quite as rigorous a rehearsal as Shaw was known for. I suspect my teachers wisely decided a group of teenagers could stand for only so much. 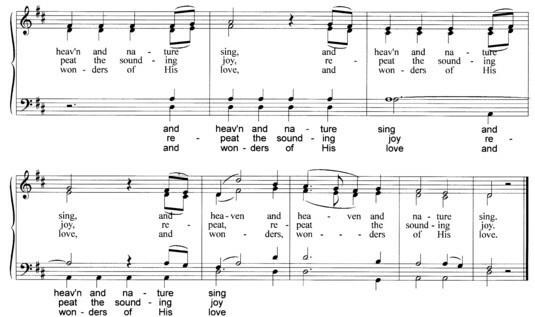 "(This is not the usage of eighteenth-century hymnodists, for whom “heav’n” could be, and usually was, scanned as one syllable in all contexts.)" For whatever it's worth: Roger Gross at the University of Arkansas says (if I recall correctly) that in Shakespeare, words such as heaven and seven are usually pronounced as monosyllables, achieved by dropping the v. An obvious example is sennight, but in Shakespeare (according to Prof. Gross) this occurs elsewhere. My knowledge of Gross's work on scansion is a bit sketchy, and I haven't time to scan Shakespeare's entire canon, so my apologies if I have this wrong. –As for [tSIkN], that looks like some horror from a Causasian language (coda [kN]?). It only needs to be English with a German accent! Malvern, Pennsylvania, is TRAP, and I think that's the obvious AmE pronunciation of the word, but I don't know about other local pronunciations, which can be quite various. Athens, Georgia is TRAP universally, but Athens, N.Y. is FACE if you're a local, TRAP if you're not. There are a lot of classical locality names in that area of New York State, generally given the traditional English pronunciation of Latin and Greek, at least by locals. As for volt, the unit of electrical potential difference, I have never heard any American say it other than with GOAT, and this is the only pronounciation that m-w.com provides. The homograph volt < Fr volte, meaning a turning movement in fencing or equitation, is also given with GOAT, but THOUGHT is provided as an alternative. As for [tSIkN], that looks like some horror from a Causasian language (coda [kN]?). It's obligatory in German, except in singing, where [ɛn] is allowed (preferred even) – [ən] is not an option. Such assimilation also occurs in English; our esteemed host has taught us about the organ grinder (/ɔːgən/- [ɔːgŋ̩]-). It's just not as widespread as I had thought, though that's not the issue – the issue is that there's an /ən/-/ɪn/ distinction within what I had believed was /ən/. One difference is that all vowels that can be dropped in this way are already spelled e in German, while the English /ə/ can be written with any vowel letter, never mind non-rhotic phenomena like Melbourne [ˈmɛɫbən]. ...[ˈæksn̩t]. How many of you say [ˈæksənt] instead how much of the time? Does anyone say [ˈæksɪnt]? For me, neither syllable of accent is reduced: hence /ˈæksent/.